Suicide Squad test screening reactions are very promising: "The movie was amazing!" Batman v Superman's disappointing reception has put a little more pressure on Suicide Squad to deliver for DC and Warner Bros., and by all accounts it sounds like it will do just that - and then some. Unfounded rumours and Jared Leto's on-set antics notwithstanding, the word of mouth has been very positive on David Ayer's supervillain team-up, and a quick glance at some post-test screening reactions will only serve to increase excitement. While this is encouraging, it should be noted that these reactions aren't necessarily coming from critical audiences. Indeed, Batman v Superman was met with a similar flood of positive tweets from early viewers, and ultimately that didn't prove to be a consensus most agreed upon. 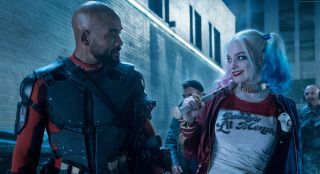 Still, with a Harley Quinn spin-off reportedly in the works it's clear that Warner Bros is feeling pretty confident about Suicide Squad, and thankfully we don't have to wait long to see if it's warranted.